Summer. You're not celebrating it properly unless you have sun, BBQs, watermelon and strawberries. 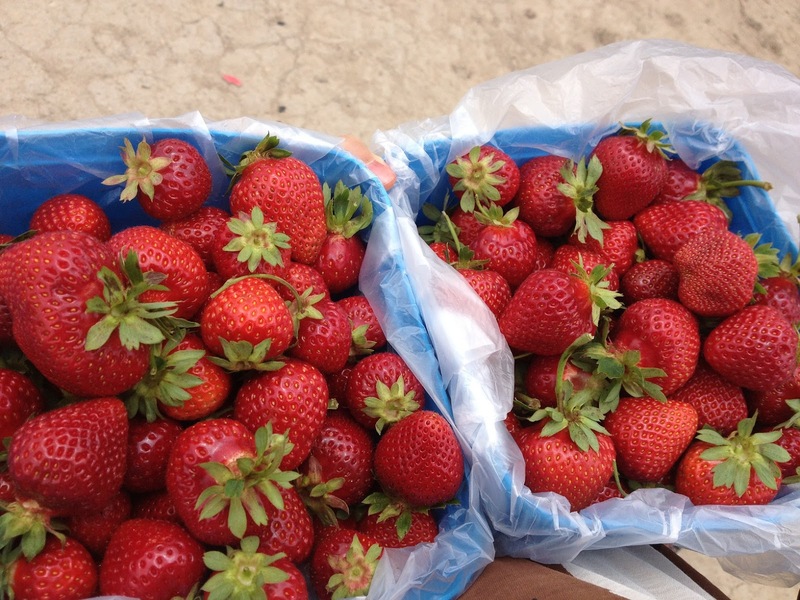 And what better way to make sure you have the freshest strawberries than to pick them yourself? We had been meaning to go strawberry picking for a while, but were always busy with something else. Finally, on the afternoon of the last day of the season, we made it to the Best Berries farm at Coatesville. We did not have high expectations, since both the commercial pickers and other members of the public would already have been through and collected the best fruit. Sure enough, we did not see many beacons of red when we cast our eyes over the fields. There was a quilt show on today though, complete with a sausage sizzle and tea and cakes, which gave the property a festive atmosphere. And having to search carefully to find the berries that are buried (excuse the pun) behind the leaves gives you a greater sense of achievement when you finally walk away with full ice cream tubs. No doubt we could have found better specimens if we had come earlier in the season, or spent longer selecting the berries, but we were still happy with our fragrant, colourful and juicy mouthfuls of summer flavour.